For other uses, see Ajo. Ajo (/ˈɑːhoʊ/ AH-hoh; O'odham: Moik Wahia or O'odham: ʼOʼoho) is a census-designated place (CDP) in Pima County, Arizona, United States. The population was 3,304 at the 2010 census. Ajo is located on State Route 85 just 43 miles (69 km) from the Mexican border. It is the closest community to Organ Pipe Cactus National Monument. Ajo is the Spanish word for garlic (Spanish pronunciation: [ˈaxo]). The Spanish may have named the place using the familiar word in place of the similar-sounding O'odham word for paint (oʼoho). The Tohono O'odham people obtained red paint pigments from the area. 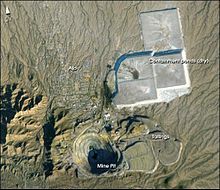 Native Americans, Spaniards, and Americans have all extracted mineral wealth from Ajo's abundant ore deposits. In the early nineteenth century, there was a Spanish mine nicknamed "Old Bat Hole" that was abandoned due to Indian raids. Tom Childs, Sr., found the deserted mine complete with a 60-foot (18 m) shaft, mesquite ladders, and rawhide buckets in 1847. He did not stay long at that time, because he was on his way to the silver mines near Magdalena de Kino, Sonora. Thirty-five years later, Childs and his son returned with a friend and started developing the abandoned mine. In the year 1884, the camp at Ajo was practically abandoned. Not a soul was in camp when Tom Childs Sr., and his son arrived. With them was Washington Michael Jacobs of Tucson, Arizona ... Childs and Jacobs located the mining claim which constituted most of the old Ajo group of mines. They made a permanent camp and worked the mines. With the advent of new recovery methods for low-grade ore, Ajo boomed. In 1911, Col. John Campbell Greenway, a Rough Rider and star Yale athlete, bought the New Cornelia mine from John Boddie. He became general manager of the Calumet and the Arizona mining company and expanded it on a grand scale. 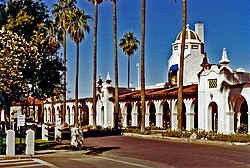 The Tucson, Cornelia and Gila Bend Railroad was built from Gila Bend to serve the mining industry and was in service from 1916 to 1985. In 1921, Phelps Dodge, the nation's largest copper company, bought New Cornelia and the mine became the New Cornelia Branch of Phelps Dodge, managed by Michael Curley. For several decades more than 1,000 employees worked for Phelps Dodge in the open pit mine. In 1983 union-affiliated mine employees went on strike. The mine continued with non-union labor for a short while before stopping production in 1985. Ajo is now home to many retired people, Border Patrol agents, and young families. Ajo is located at 32°22′53″N 112°52′10″W﻿ / ﻿32.38139°N 112.86944°W﻿ / 32.38139; -112.86944 (32.381348, -112.869407). According to the United States Census Bureau, the CDP has a total area of 28.1 square miles (72.8 km2), all of it land. Plants of the Sonoran Desert thrive around Ajo, including saguaros and ocotillos. The Ajo lily or desert lily, an onion-like plant, also grows in the area. The mineral ajoite was first found at the New Cornelia Mine, Ajo. The rare mineral papagoite was also first described in the New Cornelia mine. This area has a large amount of sunshine year round due to its stable descending air and high pressure. According to the Köppen Climate Classification system, Ajo has a hot desert climate, abbreviated BWh on climate maps. Rainfall is very low except during occasional monsoonal or frontal incursions, and is especially minimal between April and June. Since 1914 the wettest calendar year has been 1946 with 15.33 inches (389.4 mm) – including a record daily fall of 4.15 inches (105.4 mm) on 18 September – and the driest 1928 with 3.33 inches (84.6 mm). Temperatures are very hot from April to October and mild to warm from November to March, with extremes ranging from 17 °F (−8.3 °C) on 22 January 1937 during that month's record Western cold wave, to 117 °F (47.2 °C) on 31 July 1995. As of the census of 2000, there were 3,705 people, 1,659 households, and 1,088 families residing in the CDP. The population density was 132.0 people per square mile (51.0/km²). There were 2,485 housing units at an average density of 88.5 per square mile (34.2/km²). The racial makeup of the CDP was 78.70% White, 0.24% Black or African American, 6.88% Native American, 0.30% Asian, 0.08% Pacific Islander, 9.15% from other races, and 4.64% from two or more races. 37.57% of the population were Hispanic or Latino of any race. There were 1,659 households out of which 19.7% had children under the age of 18 living with them, 51.4% were married couples living together, 10.6% had a female householder with no husband present, and 34.4% were non-families. 30.1% of all households were made up of individuals and 17.1% had someone living alone who was 65 years of age or older. The average household size was 2.23 and the average family size was 2.74. In the CDP the population was spread out with 20.6% under the age of 18, 4.9% from 18 to 24, 17.2% from 25 to 44, 25.3% from 45 to 64, and 32.1% who were 65 years of age or older. The median age was 52 years. For every 100 females, there were 90.3 males. For every 100 females age 18 and over, there were 88.3 males. The median income for a household in the CDP was $25,618, and the median income for a family was $29,310. Males had a median income of $28,000 versus $18,571 for females. The per capita income for the CDP was $14,548. About 16.5% of families and 22.3% of the population were below the poverty line, including 36.5% of those under age 18 and 9.0% of those age 65 or over. Ajo Unified School District is the only regular school district in Ajo, Arizona. However, the CDP is in Pima County Joint Technical Education District's 3rd Governing Board District. There is currently a First Things First prekindergarten program, an elementary school, a middle school, a high school, and a Head Start Program, all of which are located on the same campus. The high school currently has a gridiron football team, a volleyball team, a basketball team (both boys and girls), a baseball team (boys), a softball team (girls), a golf team, and track & field. They are known as the Ajo Red Raiders. ^ "Climatography of the United States, No. 20 – 1971-2000: COOP ID: 020080 (AJO, AZ)" (PDF). National Oceanic and Atmospheric Administration. 2004. [permanent dead link] Retrieved on May 11, 2015. Wikimedia Commons has media related to Ajo, Arizona.